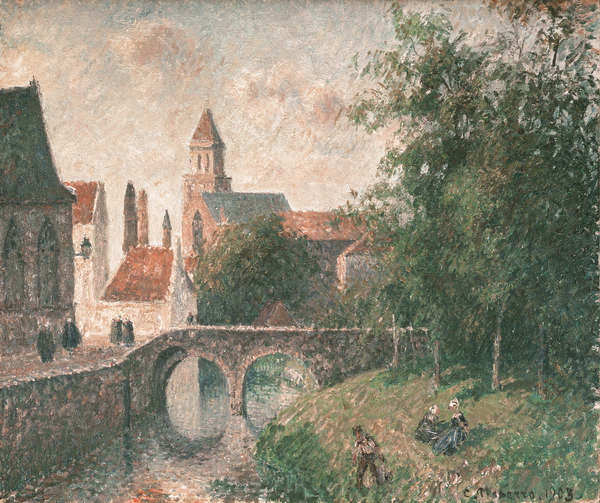 A riverbank scene, painted in an Impressionist style, showing the Pont de la Clef and the quai des Ménétriers at Bruges, Belgium. Passers-by promenade along the quai to the left, and figures recline on the grassy, tree-lined slopes to the right. The outline of the parish church of Saint Jacques appears in the background. The dark building with a small lantern on the left is the former Chapelle des Ménétriers.